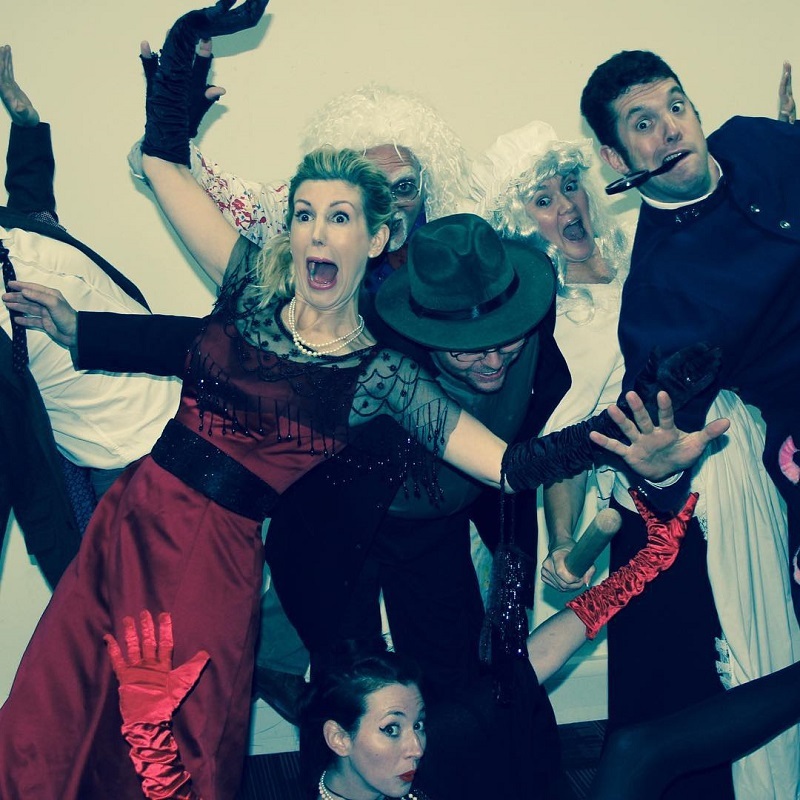 Murder Mystery is a distinctive mix of performance and interactive entertainment with an emphasis on having fun! Trained professional actors entertain your guess by playing an array of larger than life murder mystery characters. 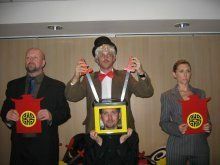 The audience act as teams of detectives whilst paper clues, dramatic scenes and mix and mingle entertainment is presented before them. The result is an evening of compelling mystery and entertainment. A household of characters straight from an Agatha Christie’s novel will mix and mingle amongst your guests, welcoming them to Sir Algernon Stanley Scallywag the Third’s 111th birthday party. As everyone goes through to dinner the belligerent old fool makes an appearance, curses everyone present, takes a glug of his whisky and promptly keels over in dramatic form. Enter Doctor Burberry Asbo – the most useless medical practitioner in existence. After fumbling about at his feet it takes the butler to identify that Sir Algernon is dead. The inspector arrives and your suspects are introduced. Who is responsible? The maid, the butler, the doctor or the local priest? Inspector Percival Dribble needs help and deputises the guests through a series of silly interactive activities. Clues go on tables and scenes unfold before the guests eyes as tables work in teams to solve this mystery. Over dessert the inspector orders a line-up and the each table reveals what they believe happened. Finally, the inspector delivers his denouncement. The murderer reacts in dramatic form and is removed from the room. The winning table is given there prize and the event closes. The start of the evening can also be presented as a magical cabaret illusion show presented by Sir Algernon. He will perform the amazing shrinking head routine and place 15 swords through the head of his assistant before his untimely demise. Doctor Bartholamew Black has been found dead in his mansion house. The evidence at the scene points to foul-play. Guests are invited to follow clues, watch scenes and, ultimately, discover the murderer in the midst. Your suspects for this evening of mystery and intrigue are: Reverend Gregory Gasper Green – This cool character gets on very well with his female parishioners – perhaps too well. Colonel Marmaduke Malcolm Morris Melvyn Mustard III – This decorated gent is every bit the upper-class war hero. Bend his ear and hell tell you a story or two. Mrs. Petula Peacock- This exotic bird is nutty as a fruitcake. Professor Polonius Plum – A mad professor with a grudge to bear. Miss Salina Scarlet – This minx keeps more than just a skeleton in her closet. Mrs. Winifred White – Dont cross this iron lady when she has a rolling pin in her hand. Maid Bella Blue – She may be blonde but shes certainly not dumb. Groundsman Burt Brown – A simple man of simple means. Surely he isnt capable of murder? Butler Giles Grey – Giles knows everything that goes on in the household. Perhaps hes sweeping more than just dust under the carpet. Inspector Percival Pink – This camp detective will orchestrate the evenings events, bringing new information to light, presenting scenes and hosting the proceedings from start to finish. Welcome to Viscount Vincent Vladimir Vertigos annual dinner and dance. During the course of the evening a victim is found drained of blood and with two suspicious teeth-marks in their neck.Question the assembled suspects with the help of self-acclaimed vampire-hunter, Professor Wilhelm Van Helsing. Clues will be made available, scenes will be acted out. Use your imagination and ingenuity to uncover the vampire before the break of day. Star Wars meets Star Trek and Spocks fly. A Jedi knight will lead you through the evenings events. Captain James T. Berk has been found dead in his quarters. As an array of familiar faces line up in front of you, you must decide who the murderer is. Was it Scotty who could not take any more? Did Obiwan use force? Or was Doctor McCoy – Doctor Death? Murder Mystery – Who Killed Whally? As an array of toothless, one-eyed, slachjawed, blubber-bellied excuses for men line up in front of you it is your job to decide who was devious enough to kill for the lost ruby of Wally Whipsnade. The year is 1936. Early in the year Professor Leopold Caracticuss discovered the hidden tomb of King Tut Tut. In the tomb was discovered a priceless gem. The famous jewel is to be unveiled to an assembled party of experts at a dinner party in London. When the sealed pot containing the jewel is opened; it is found that the jewel is missing. The culprits include Professor Leopold Caracticuss, Igneous Black (the professor’s assistant) and Lady Marmalade Smithers (a rich but barmy old lady with a taste for the finer things in life). Detective Inspector Sherlock Watson will orchestrate the evening’s events as you help him decide who stole the jewel, what was their motive and where is the jewel now. Modern day East End of London. A bank robbery has been pulled off in Bow. Larry the Lag has been instructed to pick up a case containing the stolen loot from a warehouse and take it to the bosses house on the other side of town. He arrives during a party to celebrate a succesful job. The case is opened but the loot is gone. The culprits include Vera the Viper, Tony the Tea Leaf and Squirmy Sid. Help Larry discover who stole the money before the boss arrives for his party and finds there isnt anything worth celebrating. Murder Mystery – Gold Gold Gone! A daring gold robbery has taken place in broard daylight and has succesfuly penetrated the high security of The Bank of England. In the Barclay club in London the great detectives Shylock Bones, Haircurl Poorrow, Inspector Clueless and Mrs Marbles review the facts and attempt to uncover who the culprits are. Can you help? Your enchanting evening is interrupted with the news that Professor Critch has been petrified and the Dark Mark looms over the castle. Interview Professors Dumblesnor, Snoop and McGonagen as well as Groundsman Hogrid and student Larry Potter to find out who is harbouring “He Who Shall Not Be Named”. This fantastic package is perfect for Halloween, haunted or historical venues or any occasion that requires a distrinctly spooky feel. It includes One 4 man spooky murder mystery (to take place over dinner). A spooky character mix and mingle with the guests and a 6 piece function band playing great party music. The actors and the band then join together for a spooky set featuring music from and inspired by The Rocky Horror Show. 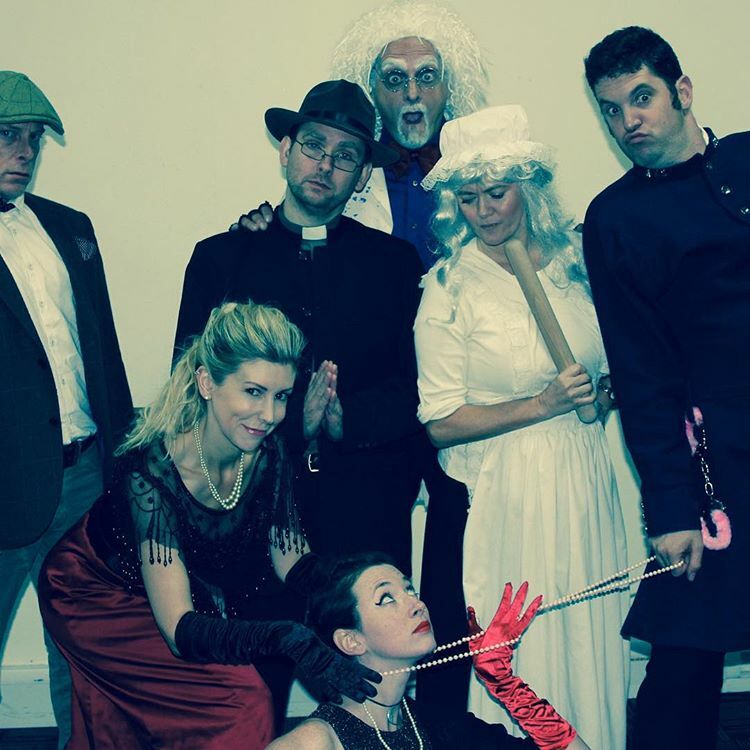 An evening of Murder Mystery and Monster Music featuring songs from The Rocky Horror Show. You decide on the theme. It can be literally any theme. Gangsters, Carry On, Fawlty Towers, Allo Allo, Doctor Who, 1950’s Hollywood, Men in Black or Masquerade. You name it and the team will write an event to the exact specifications of the client including company humour and “in-jokes”. All Murder Mystery Evenings come with paper clues and rehearsed scenes and interactions that are performed during the course of the evening. The company is experienced in entertaining large audiences. They have entertained over 300 people in large venues like Celtic Manor, Five Lakes Resort and Coombe Abbey. They can use specially created film footage, music and scripted scenes performed on stage and the Inspector is a trained host. All this in addition to paper clues and character mix and mingle entertainment. This means that they cater for two types of audience: those that want to puzzle out the clues and have a competitive nature and those who want to let the event wash over them and enjoy the entertainment. The Murder Mystery evening runs for the length of dinner; starting at pre-dinner drinks and concluding at coffee or dessert. Approximate length is 1 hour and a half to 2 hours. 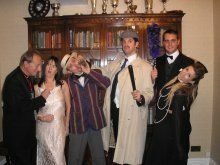 Four man Murder Mystery is perfect for up to 40 guests. One additional character is recommended for every ten additional guests.